Film and history buffs accessing decades’ worth of Canadian content on their mobile devices can in part thank Atempo Inc., the data backup and storage company providing the archiving for Canada’s National Film Board’s huge collection of films. Since its inception in 1939, the NFB has created more than 13,000 productions, including documentaries and animation films aimed at preserving Canadian heritage and culture. France-based Atempo has been providing the archiving for the National Film Board’s digitization undertaking for the past two years. “It was really important to make sure that the NFB preserved this collection,” says Julie Dutrisac, head of research and development at the NFB. “We are public producers,” she adds. The NFB’s digitization process has been going on for several years, she says. Backing up all the content, though, while keeping it accessible was the challenge. So the NFB began using Atempo Digital Archive for all digital masters and source files, including related meta-data, for restored and new works. The product is meant to be scalable, which is important with new content being generated over the years at the NFB, along with thousands of films over the years. 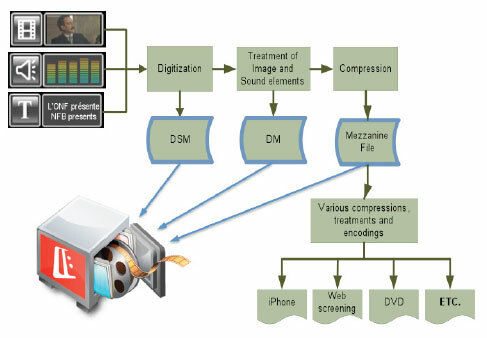 Atempo Digital Archive divides up one digital master file into various mezzanine files, stored with associated meta data. “In order to index and know where things are, we had to go out and seek a solution that would do much more than a typical backup solution,” Dutrisac says. “Atempo was really good with understanding our needs,” she says. The total budget for the digitization and archiving process has been roughly $3 million, which came out of the NFB’s operating budget, according to Dutrisac. Atempo distinguishes between backing up data and archiving it, which is for fixed content rather than active work, according to the company. This is especially important for the NFB’s content, Dutrisac says. NFB needed “a way to digitize the content and not touch it again,” she says. “This is really a big, big effort that NFB is undertaking,” says Laurent Fanichet, marketing director at Atempo. “Atempo is not actually intervening in digitization. We are coming in with software platform,” he says. “Atempo comes from the world of data management and storage,” he says. With each film, the NFB creates one “mirror-image” of the production from its vault, one high-resolution version where colour and sound are restored and one mezzanine file, or a compressed file that can be uploaded and accessed quickly. These file types are used for mobile devices like tablets and smartphones. Research in Motion’s BlackBerry Playbook comes with the NFB application already in place and users can download similar apps for Apple and Android products. Currently, Web users have access to more than 2,000 films through NFB.ca. Accessibility is also a major issue for the NFB when digitizing its content, Dutrisac says. Currently, all films from the 1980s until today are available with subtitles for the hearing impaired and more than 300 films feature descriptive video for the visually impaired. Atempo’s unique solution is akin to shattering a digitized movie into thousands of different parts, all meticulously tracked and itemized. The mezzanine files allow for on-demand reassembly of the original digital master in a manner best suited for the user’s platform and bandwidth speed. Atempo’s archiving product integrated with the NFB’s existing asset management system. Both the NFB and Atempo’s research teams worked together to develop an XML plug-in that automates the archiving process. Atempo Digital Archive also allows for drag-and-drop retrieval and a simplified search for finding data quickly. The NFB created its online “screening room” in 2009 as part of its 70th anniversary. The organization has been moving towards a broader digital strategy for several years now, partially because of Tom Perlmutter, who took on the leadership role at the NFB four years ago. Over the years, NFB productions have won more than 5,000 awards, including 12 Oscars. Harmeet reports on channel partner programs, new technologies and products and other issues relevant to Canada's channel community. She also contributes as a video journalist, providing content for the site's original streaming video. Harmeet is a graduate of the Carleton University School of Journalism.